Pollen dispersal was investigated in five remnant populations of Eucalyptus wandoo, a dominant insect-pollinated tree in the fragmented agricultural region of southern Western Australia. Paternity analysis using six microsatellite loci identified a pollen source for 45% of seedlings, and the remainder were assumed to have arisen from pollen sources outside the stands. Outcrossing was variable, ranging from 52 to 89%, and long distance pollen dispersal was observed in all populations with up to 65% of pollen sourced from outside the populations over distances of at least 1 km. Modelling dispersal functions for pollination events within the two larger populations showed little difference between the four two-parameter models tested and indicated a fat-tailed dispersal curve. 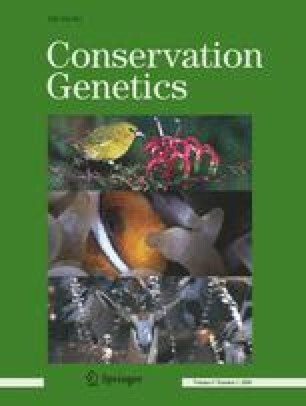 Similarity of direct and indirect historical estimates of gene flow indicates maintenance of gene flow at levels experienced prior to fragmentation. The study revealed extensive long distance pollen dispersal in remnant patches of trees within a fragmented agricultural landscape in the southern temperate region and highlighted the role of remnant patches in maintaining genetic connectivity at the landscape scale. We thank Bronwyn Macdonald for assistance with laboratory work, Richard Fairman for assistance with fieldwork, and Matt Williams for fitting the dispersal curves. This work was supported by Land and Water Australia.